Store radish bulbs and tops unwashed in separate plastic containers or wrapped separately in paper towels or clothes, in the refrigerator drawer. Greens will last 3-4 days and the bulbs will last about a week. 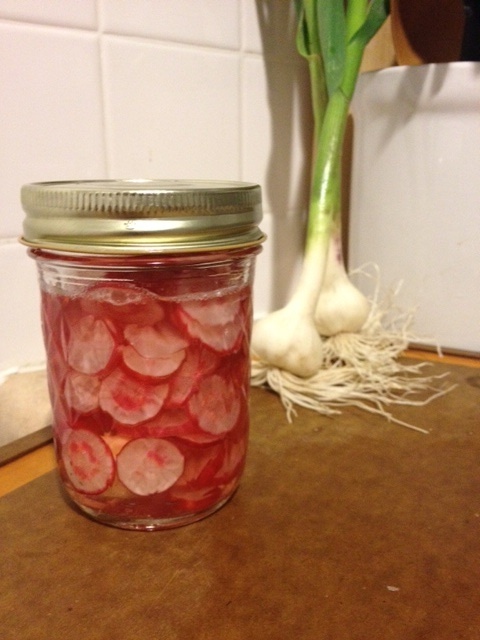 You can, of course, just enjoy your radishes raw and crunchy, or quick pickled or on bread with butter and salt. 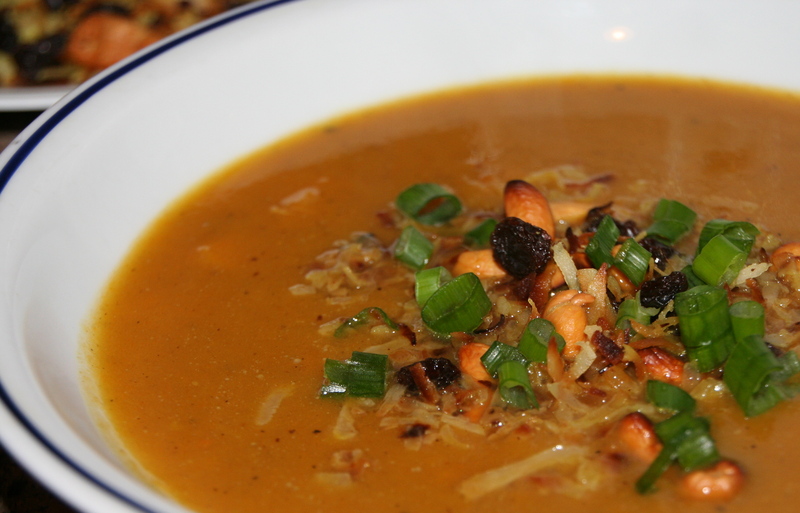 This recipe’s twist on butternut squash soup is a great way to use winter squash. Delicious! 2. Cut the butternut squash, onions, and apples into 1-inch cubes. 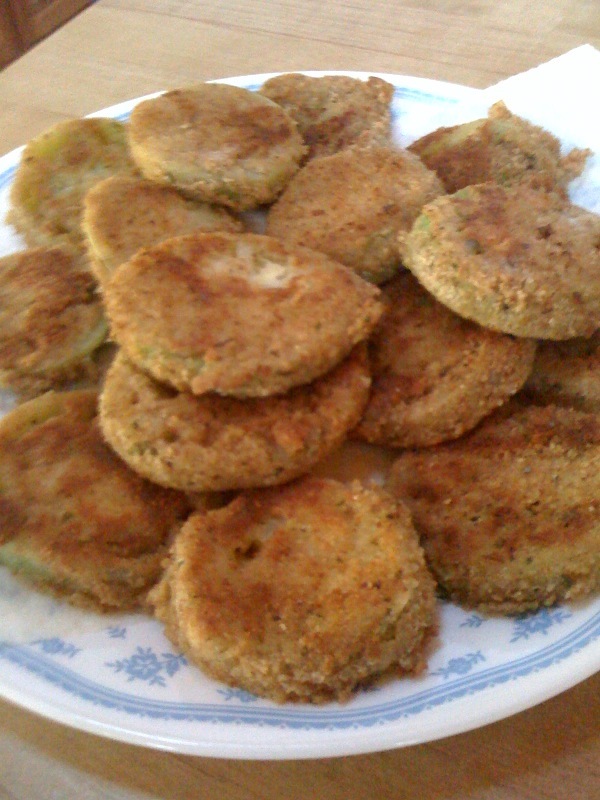 Place them on a sheet pan and toss with the olive oil, 1 teaspoon salt, and 1/2 teaspoon pepper. Roast for 35 to 45 minutes, until very tender. 3. Meanwhile, heat the chicken stock until it’s simmering. When the vegetables are done, place them in batches in a food mill fitted with the medium blade. Process and pour back into the pot. (Alternately, you can also place the roasted vegetables in a food processor fitted with the steel blade. Add some of the chicken stock and purée.) When all of the vegetables are processed, place them all in another pot and add enough chicken stock to make a thick soup. Add the curry powder, salt, and pepper to taste. Be sure you use enough salt and pepper to bring out the curry flavor. Serve hot with condiments on top of each serving. A good article abut the honey business. 1. Toss orzo into boiling water and boil for 9 minutes. Strain and set aside in a mixing bowl. 2. For quinoa, bring 1 cup of broth to a boil. Stir in quinoa and simmer for about 10 minutes, or until quinoa gets fluffy. 3. In a frying pan, saute minced garlic in butter. 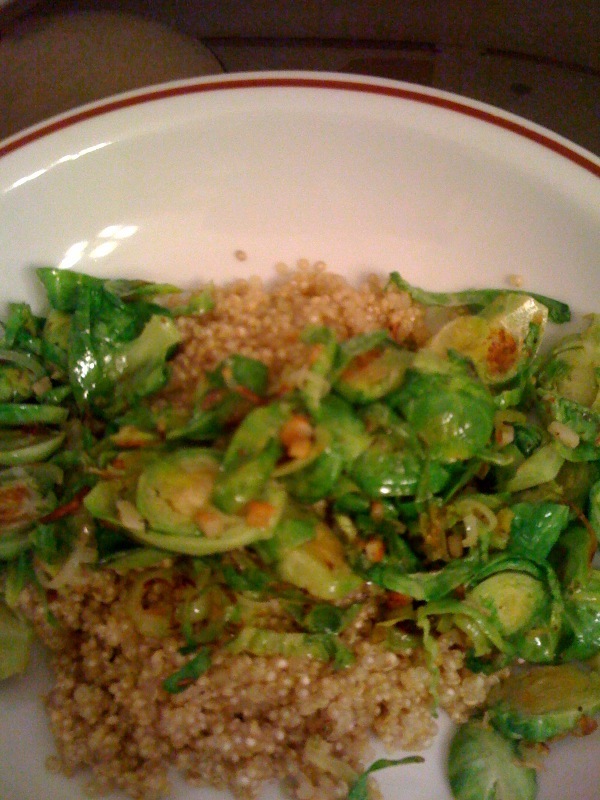 Slice Brussel sprouts lengthwise and lightly brown them in frying pan with a little olive oil. 4. Add all ingredients into the mixing bowl with the orzo and stir. Salt and pepper to taste. 1. In a large bowl, combine the cornmeal (or bread crumbs), flour, garlic powder, and cayenne together. 2. Pour the buttermilk (or eggs) into a separate bowl and season with salt and pepper. 3. Dip the tomatoes in the buttermilk (or eggs) and then dredge them in the cornmeal (bread crumb) mixture, coating both sides well. 4. Place a large cast iron skillet over medium heat and coat with the oil. When the oil is hot, pan-fry the tomatoes (in batches if necessary) until golden brown and crispy on both sides, about 3 to 4 minutes on each side. 5. Carefully remove the tomatoes and drain on paper towels. Serve with hot pepper sauce and lemon. Apples from the farm have been chopped up and my dad’s Apfelkuchen Americanisch (German Apple Cake – American style 🙂 is hot out of the oven. Geschmack! 1. Mix flour, sugar, vanilla, oil, baking powder and eggs. 2. Add apples, walnuts and raisins. 3. Spread in a greased 9×13 cake pan. 4. Bake at 325 degrees for 1 hour or until a toothpick comes clean from the center. 5. Let cool. 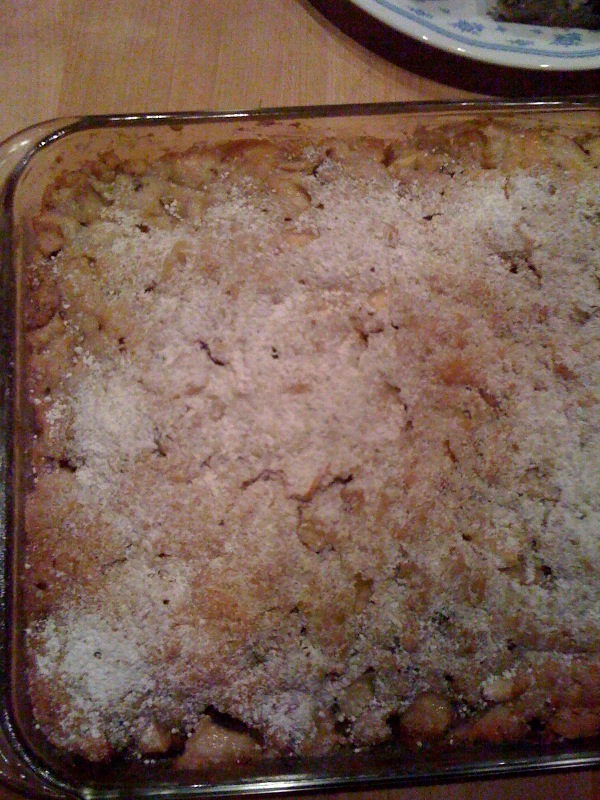 Top with confectionary sugar. 1. Fill a large high sided skillet with some water, adding enough to be just shy of the rim of the pan by about 1 inch. Place over high heat and bring up to boil; add a big pinch of salt and the green beans. Cook for about 5 minutes, the beans should still be crisp. 2. Drain the beans and then run them under some cold water to stop them from cooking. Reserve the beans while you start the onions. 3. Return the skillet you cooked the beans in to the cook top over medium heat. Add the almonds and toast stirring every now and then until golden, about 3 to 5 minutes. Remove the almonds from the skillet and reserve. 4. Return the skillet to the heat and add the butter and olive oil and heat until the butter has melted. 5. Add the onions, season with salt and pepper, and cook stirring frequently until the onions caramelize, 20 to 25 minutes. 6. Add the thyme, and cook for another 5 minutes. 7. Add the cooked cooled green beans and almonds, and stir well to combine. Season with salt and pepper, to taste. Notes: I served this with Paula Dean’s White Bean Chili, a side of sauteed greens from the CSA and a side of corn bread.